One of the sunflower families' most useful plants. German Chamomile, Matricaria recutita or M. chamomilla, is an herb that originated in Europe. Having escaped to the wild and now naturalized on almost every continent, it can be found growing along fences, roadsides, in sunny open fields and in herb gardens. German Chamomile is part of the Sunflower Family, Asteraceae. The tiny daisy-like flowers are white with raised, cone-shaped, yellow centers. Flowers are about an inch wide, growing on long, thin, light green stems, which are branched, round and hollow. The entire plant has a fruity apple-pineapple scent and grows erect to a height of 20 to 36 inches tall. Its leaves are bipinnate, light green and feathery, and flowers explode into bloom from May to October. Once in bloom, the above-ground parts of the plant may be gathered and dried for later use. It is from the plant’s fresh and dried flower heads that infusions, liquid extracts and essential oils are made. Propagation is from seeds, which can be sown in spring or fall. Although drought tolerant once established, German Chamomile needs plenty of water to germinate and for development of young plants. It will tolerate many soils, but prefers sandy, well-drained soil with a pH of 7.0-7.5 and lots of sun. Flower heads are harvested in summer while in full bloom. Flowers can be used fresh, frozen or dried. However, volatile oils are lost rapidly upon drying. The medicinal uses of German Chamomile go back thousands of years to the ancient Egyptians, Romans and Greeks. Its medicinal virtues were deemed important enough that Hippocrates, Galen and Asclepius made written references to it. German Chamomile is one of the most widely used flowers for herbal tea. Chamomile tea is so popular, it is found in most grocery stores. With its many medicinal properties, appropriate for both internal and external application, the flowering tops of the Chamomile plant are also used to make liquid extracts, capsules and tablets. While studies in people are few, animal studies have shown German Chamomile reduces inflammation, speeds wound healing, reduces muscle spasms, and serves as a mild sedative to help with sleep. Test tube studies have also shown Chamomile has antibacterial, antifungal and antiviral properties. German Chamomile has been used to treat a variety of conditions, including: Abscesses: Acne; Allergies; Anti-inflammatory properties, making it good for rheumatism, arthritis, and other painful swellings; Antispasmodic for intestinal and menstrual cramps, relieving gas pains, and a very mild but efficient laxative; Anxiety; Chest colds; Children's conditions such as chickenpox, diaper rash, and colic; Eczema; Fever; Flu; Gastrointestinal conditions such as upset stomach, gas, inflammatory bowel disease (ulcerative colitis) and diarrhea; Gum inflammation (gingivitis); Insomnia; Minor first-degree burns; Psoriasis; Sore throats; Stomach ulcers; The herb is also used topically for skin conditions and for mouth ulcers resulting from cancer treatment. 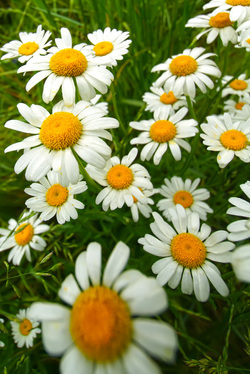 German Chamomile flowers are used in hair shampoo, which is especially beneficial for fair hair. The flowers are sometimes added to cosmetics as an anti-allergenic agent or made into a salve for use on hemorrhoids and wounds. Dried herbs are used for potpourri and aromatherapy. There are Chamomile salves to treat skin inflammations, sunburn and burns. Add Chamomile to the bath for relaxing tired, achy muscles and feet, and to soften the skin.